The warm islands of Grenada will soon become the destination of choice for many female travellers as the Grenada Tourism Authority (GTA) launches its ‘Grenada Girls Getaway’ promotion. The 7–month promotional strategy that starts on 1 June 2015 offers value-added deals on hotels, tours, and car rentals to two or more women visiting Grenada. “During some of our recent trade shows in the USA, our travel trade partners requested that we create group travel promotions. Our research also shows us an increasing trend in group travel,” says Ms Nisha Mc Intyre, GTA’s Marketing Executive. Millennial females are being specifically targeted for the campaign, given their frequent use of social media and influence over the travel patterns of other generational groups. 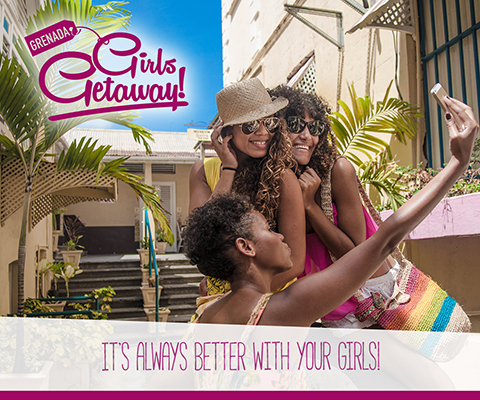 The start of the GTA’s Grenada Girls Getaway promotion coincides with the new airlift from American cities. On Saturday, 6 June, Delta Airlines will begin a weekly service from Atlanta, and on Thursday, 11 June, JetBlue Airways will begin a twice-weekly service from New York. The Grenada Tourism Authority has begun an integrated marketing campaign that uses direct trade and consumer engagements as well as digital media marketing to support the Grenada Girls Getaway promotion. Interested travellers will be able to signup for the value-added deals via Grenada’s official destination website, www.puregrenada.com.